Home / Gliding FAQ / How fast does a glider fly? The fastest glider is probably the Space Shuttle. Five minutes before landing, and well into the Earth’s atmosphere, its already slowed down to around 800mph and from there to touch down is being flown in the same way as we fly and land gliders! 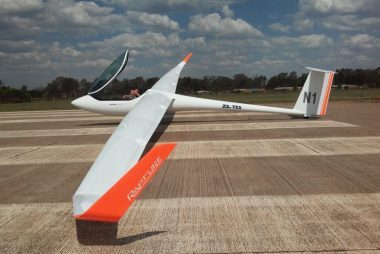 A modern high-performance glider/sailplane may have a VNE (velocity never exceed) as high as 155knots (180mph). This is its maximum allowed speed. It could go faster but it’s not structurally designed and tested to do so. 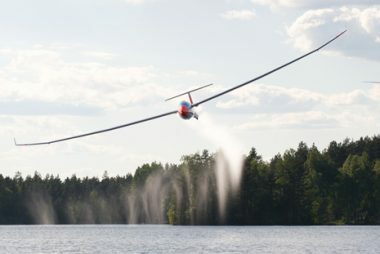 During a cross country flight, the glider may be climbing in thermals, rising air currents, while flying slowly at perhaps 50mph. But when ‘cruising’ between thermals might be flying at speeds between 70mph and 100mph or more. Glider pilots flying cross country aim to fly as fast as possible for the day’s conditions. This means they will seek out the strongest lift, ignore weaker lift, and fly at optimum speeds between thermals. There is a real science to this called ‘speed to fly theory’. 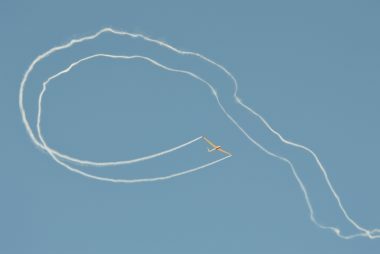 These days many gliders have ‘Flight Director’ computers that make efficient flying at the right speeds easier. The current speed record for a 300km flight around a triangular course is over 160km (100mph). This is the average over the whole flight. Remember, it takes into account the time spent climbing in thermals where in effect the glider isn’t really traveling around the course! Gliders are fast, highly dynamic, and maneuverable aircraft. Most, are cleared for some aerobatic maneuvers and are able to fly fast enough to gain enough speed to loop the loop!